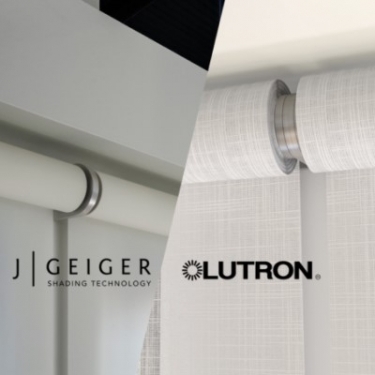 Judge rules J Geiger motorized shades trade-dress design lawsuit versus Lutron can moved forward, but denies 'unjust enrichment' claim. New York judge says J Geiger's "shade sandwich" lawsuit against Lutron can proceed. A lawsuit brought by J Geiger alleging Lutron's Palladiom motorized shades infringe on patented designs is moving ahead. J Geiger makes roller shades for home-automation company Savant. J Geiger sued Lutron Electronics last year, claiming Lutron’s new Palladiom motorized shades infringe on Geiger’s minimalist design, comprising a center bracket with a "clean, U-shaped element, where the U-Shaped element fits seamlessly between two shade ends that abut the same, effectively creating a 'shade sandwich' with the U-shaped element in the middle." Geiger filed a preliminary injunction to halt Palladiom sales but a judge at the time denied the request. GeigTech (the patent holder) “utterly failed” to demonstrate that its design had any meaning in the marketplace, a judge said when denying Geiger’s injunction request. "Defendant and other competitors would be free to design minimalist shading systems as long as those designs did not look too similar to Plaintiff's trade dress ...."
Lutron filed a motion to dismiss the claim altogether, but late last year a judge denied Lutron’s motion, setting the stage for Geiger’s trade-dress infringement lawsuit to proceed. Geiger’s shade brackets are exposed, hiding electronics and cables within a “clean, U-shaped element” for a minimalist look that eliminates the need for valances, fascia or other disguises. Lutron’s Palladiom shades (and others on the market) have a similar look, which Geiger claims to be a patentable design. Lutron claims the shade design is functional, not just ornamental – a key distinction in trade-dress claims. Lutron further claims that Geiger’s design is generic, and that minimalist designs are in vogue. Indulging Geiger would be granting the plaintiff a “monopoly on its vaguely alleged 'clean' and 'minimalist' design,” according to Lutron, “and third-party competitors would be barred from introducing their own clean, minimalist window shading designs, thereby harming competition and reducing consumer choice." Plaintiff does not seek protection over all minimalist shade designs - it seeks protection over its specific trade dress, which it describes in detail in the Complaint. Defendant and other competitors would be free to design minimalist shading systems as long as those designs did not look too similar to Plaintiff's trade dress, so that customers would be confused about their origin. As to another Geiger claim – that Lutron has enjoyed “unjust enrichment” from allegedly plagiarizing Geiger’s shading design – Judge McMahon denied that motion. The case on trade-dress infringement can proceed.